Strictly speaking CoQ10 is not a vitamin. But it is so important to our body that I have included it here so you don’t miss it. Its antioxidant properties are significant and it is thus an important component of any mens vitamins and womens vitamins. Antioxidants (Insert Link) are important in dealing with free radicals and help to prevent degenerative diseases.
. CoQ10 is reported to aid in maintaining healthy gum structure, very important if you want to keep your teeth because advancing recession of the gums increasingly exposes the roots. 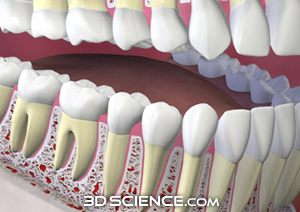 This can lead to decay in the roots and ultimately to loosening and loss of teeth. Flossing is important in preventing "periodontal disease", but so is CoQ10. Hydrosoluble form is the most bio-available. •	Adults – at least 12 mg/day - see It's About Health (link below) for levels used in medical studies for specific medical conditions. Toxicity is not known and it has been safely taken in medical studies as supplements up to 1200 mg/day. Some side effects were noted in some patients at doses above 600 mg/day.